Baseball, Basketball, Football, Wrestling... You might be asking... What do all of these things have in common? STRANGENESS. Thats right, STRANGENESS, and in this episode we're talking SPORTS STRANGENESS with very special guests The Sports Lordz! (Kevin Cobbs, Diego Martinez, Jimmy O'Connell). 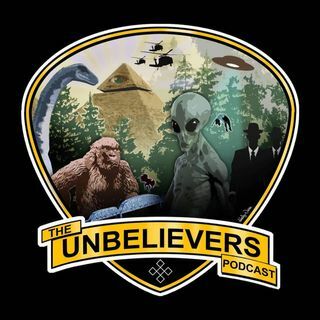 From Haunted Hotels to Alien Abductions, The Unbelievers & The Sports Lordz cover some of the most UNBELIEVABLE paranormal sports stories out there, SO TUNE IN NOW & CONTINUE to LEARN to ... See More UNLEARN, EVERYTHING YOU KNOW! will be dying of suspense til I find out! Yeah I know! It’s a movie that’s Unbelievers related?! I know right? This is like the 4th or 5th. There’s the “A-A Ron” reference for ya! I'm going to update my online dating profiles as "horny for ghosts"